There are people who have talents beyond ordinary skills acquired from the 4-walls of a classroom and Port Harcourt based humour merchant and graduate of Petroleum Engineering Engr. Angel Ishmael Atta alias ANGEL D LAFF is your everyday regular next door man who will keep you laughing your ribs out whenever you have an encounter with him. 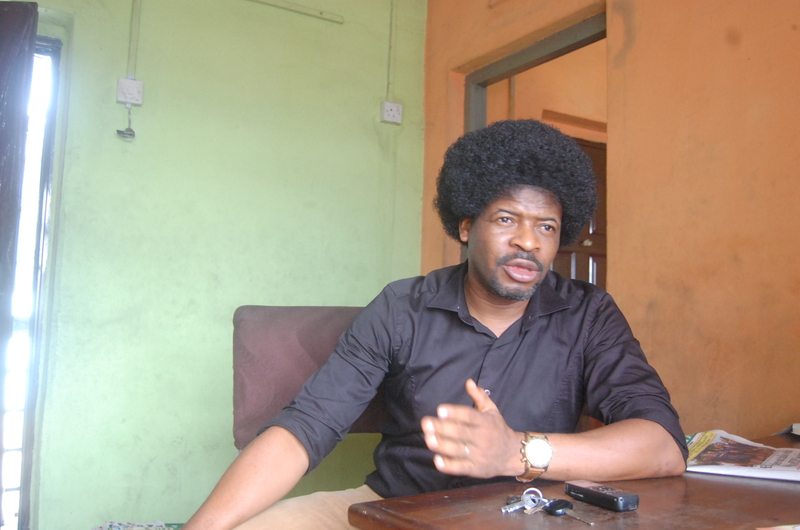 He wears large afro hair-do as a trade mark being well known with hilarious jokes as a comedian. And this has earned accolades across various high profile segments of the society as he was recently awarded with Ambassador of Nigerian Police Force. Born as Ishmael Angel Attah with stage name Angel D’ Laff as he is popularly called and he graduated from Rivers State University of Science and Technology Nkpolu Orowurokwo Port Harcourt with a Bachelors degree in Petroleum Engineering. The Nembe Bayelsa state born Engineer and Comedian of the Federal Republic of Nigeria Angel D’ Laff had an encounter with the crew of www.towncrier.ng on Tuesday 19th, June 2018 where he spoke on key issues especially his decision to embrace Comedy in place of working in the Oil and gas sector. My name is Engineer Ishmael Angel Attah, popularly known as Angel D’ Laff the Comedian of Federal Republic of Nigeria—CFRN. I am Ambassador of the Nigerian Police Force and the HOST OF PORT HARCOURT COMEDY CLUB At Platinum Lounge Hotel Port Harcourt. Port Harcourt being the hub of Crude Oil business in Nigeria how has this affected Comedy Industry in Port Harcourt? I wouldn’t like to compare it with that of Lagos in terms of financial drives, Lagos is far ahead but in terms of comparing it with other cities within the South-South, Port Harcourt is better as you can make a good living here twice or more than your contemporaries in Lagos will make. How did you start comedy business in Port Harcourt? It is a long journey of course yes, people don’t just wake and say they want to be Comedian as you must have interest in it maybe from Primary school , secondary School and some characters you must have portrayed right there in the class room, the social activities and all that. But I got inspired by listening to late Boma Erekosima if you are born around this city you will know people who brought Humour Pidgin English language to Radio and there was one programme on Radio a lot of people want to listen late Boma Erekosima and I got inspired by Boma Erekosima. And from My Primary School I took part in competition called “Akonaki” it was for all secondary schools. It was biggest platform for secondary school students to showcase their talents and the likes of Duncan Mighty was also discovered by “Akonaki” and Timaya and myself were all discovered by “Akonaki”, so I listened to late Boma Erekosima you will find out that I even talk like Boma Erekoaima and his Countryman stuff and all that unfortunately Boma Erekosima died. Tony Vincent Ejeri took over the role of Boma Erekosima I happened to be on the watch of Tony Vincent Ejeri as he got me trained on how to cast local news in Pidgin English Language. So we started from that point and I was doing that in secondary School until the day when the wife of group Captain Ayeni the Military Governor of Bayelsa state when it was newly created visited my school and my Social Master said “Angel you come up with your Countryman stuff” and I did that stuff and the woman happened to be a fan of late Boma Erekosima and that was how I got my first big chance to perform at Bayelsa state Government House under the programme Family Support Programme-FSP initiated by Miriam Babangida late wife of Military President Ibrahim Badamosi Babangida. I later realized that the Country man stuff we do has a close rank with stand-up comedy like the likes of ALI BABA, YIBO KOKO, JULIUS AGWU they have been pushing for the stage known as A DAY OF A THOUSAND LAUGH, so we realized that they have that potentials and so we had a little switch and God’s willing one little step after another it was difficult and we Thank God that people like Eric here they contributed so massively in my life when we were at NTA Channel 10 Port Harcourt we learnt so much on Television and so much on presentation, so much on talent, discipline and all that and today is the right fruit as you can see. What course of study did you come out with from the university? I studied Petroleum Engineering from the University of Science and Technology Nkpolu Orowurokwo Port Harcourt and I came top of my class and if I know what I know now maybe I wouldn’t have studied Petroleum Engineering, to me maybe I would have ventured into something like entertainment that is 6-years plus national Youth Service Corps Scheme-NYSC I would have gone for something else. I would say that it is a waste but knowledge is knowledge but if I had put that time into my Comedy industry it would have been a plus as you know in this country e study things that sometimes we don’t need them. When we look at the Economy of the state of California in USA being the 6th largest World economy, we see what entertainment and Silicon Valley technology industries have done to their economy, how about Nollywood and comedy industries in Nigerian Economy? I would like to break it down into two sectors if we look at the West, I mean South west of Nigeria there is this mentality built in them , the Yoruba man likes entertainment be it local bit , mixed, foreign or whatever, they know how to rally around themselves, they know to drive humour and they know to drive fun. It is a natural thing in Yoruba land. Perhaps they injected that into the entertainment industry generally and that is why we say that Lagos is like USA that harbours a lot of talents every day, as everyday people are relocating from their states within Nigeria to Lagos why because Lagos has given that room where you can make good living from your skills. But in other parts of Nigeria we don’t not have such privilege because it is either Government or the private sector do not see the importance of skills and talents. So, what they see is politics , policy, it is medicine, Health sector, what they see is do good road for the people and provide electricity that is all that they know. But they don’t know that life family depend on this comedy industry. Imagine the government and the private sector investing in entertainment in this part of the country where we are even you the journalists you are going to enjoy your professionalism other than covering only political events, this one is against this one and even when you come to do your job they will say oh you are APC or you are PDP. That divide has actually divided the talents. And even in more recent times we are even in trouble if you perform on stage they will say you are APC comedian or PDP Comedian as in this state people don’t see the creativity in you, they don’t see the skills in you people don’t see that you are doing a job for a living. But in Lagos when you go there, there is no APC Comedian, there is no PDP comedian. These people are breaking records see now they are international look at Wizkid, look at Davido, these boys are breaking records internationally and no more Lagos or within Nigeria anymore but internationally. The government in Lagos has seen the importance of the skills in this industry and they invested in it. And today, look at the result. Politics alone cannot give Nigeria that image that we are looking for outside but entertainments do. So, you can now see that with time we cannot say that Nigeria can get close to California but Lagos will get close to California. This is because Lagos is like a country of its own. You can see talents that are here you are paid ten thousand Naira(-N10,000) here and if you relocate to Lagos and you make it a little bit big and by the end of the day you are getting more than hundred times more than money that was being paid to you in your local base here. So, why won’t you go to Lagos? So, the people who understand the industry, we have culture and Tourism here what do they do that’s Culture and Tourism, what do they do as Culture and Tourism? So, it is a big concern to us here at Port Harcourt. How do we use comedy to manage series of heart attacks/Cardiac arrest we are having in the society nowadays? Cardiac arrest became known within Nigerian society within 2006 and 2007, the mortality rate was so high but if you check within recent time it has actually gone down if you go through statistics in Nigeria it has actually gone down and many thanks to the comedy industry not just stand-up comedy but the movie you can see that the comic movies sell better than the horror, action or whatsoever, as a lot of Nigerians want to be happy whether they have money or they don’t have money they just want to be happy. And of course you must thank God for the comedy industry. Check in the last 10-years the number of comedians we have in Nigeria has increased drastically before this time you must be known by your name before the microphone is handed over to you. But now just mention that you are a comedian the microphone will be given to you for you to go and do your thing. They just want to be happy. My fear is that comedy is becoming too expensive that even the common man may not even be able to afford it that is the area we are getting to. As you can see in our Comedy event a Table goes for N2million , N3million or N1Million or so, we are getting to that point where the common man will not be able to afford the best of humour that is being dished out from the big live stage. So, maybe perhaps people will wait and buy the CD on the road and go home and see if they can watch it for themselves but being live there to enjoy the feel one on one I am afraid the same thing with music thank God for our Nigerian music industry it is not only comedy that is also helping to relief our stress music also contributes. You see today everybody wants to dance Shaku shaku as they don’t want to know if money is left in their pockets all they want to do is that they all want to survive. Earlier you said about PDP/APC divide affecting entertainment industry, what are the things to be done to bring it at par with Lagos state entertainment industry? Sincerity is a key thing you saw of recent the Government of Rivers state had their 3rd year anniversary in office and it is bitter if you should say the truth as I have been known for speaking the truth as senator Dino Melaye will say “ if you talk you die if you don’t talk you die….all die na die” , you say you want to encourage local content that to say you want to encourage those who are plying their trades here and those who refused to leave the city but rather built an industry here and when opportunity like that comes what do you have, you have 90 percent content from outside and 10 percent content from inside. Okay even if you have 10 percent content from inside what is the payment ratio given to these people who have invested so much in this industry, you give them peanuts and you pay millions of Naira to contents that are coming from outside…then in what ways are you encouraging others to stay back and build an industry here? Definitely you telling them to leave go out if make it we recognize you if don’t make it big we don’t recognize you. Oh! It is really a big challenge. To cement that divide the politicians should understand that most entertainers are not politicians they are professionals and at all points if you call them and the environment is okay and the theme of your events is okay and it falls within their belief they will come and do their trade. This is one thing they should understand. And not because you are paying a comedian N1 or N2 and musician N1 or N2 as such you will now decide on what area of his skill he is going to bring down to the stage saying oh no don’t talk about this or you must praise us. Though we are not praise singers we are here as professionals, social commentators we say the things that are right and we say the things that wrong. You must see us in that light and of course pursue them. The only way they can cement this finally it is when we have visionary leaders we will not only think about sectional politics but think about like the philosophers would want to put it this small unit that we build on to become a forest for tomorrow this is because if you build this small unit when they are frustrated it will even be more than the militancy era that we have because so many talents in the entertainment industry you wouldn’t like to know so many talents in the music industry you wouldn’t like to know from down to music if these people get so frustrated they have nothing to fall back to they will fall back to the street and the governor will think about another amnesty. This is because they did not invest until they begin to carry arms against the government and the government will begin to remember to give them another amnesty to keep them quiet. That is the kind of Government we find within our environment. How do you bring up young talents into the comedy industry as the ones there now are aging like Ali Baba, I go die, Angel D’ Laff, Basorge Tariah Junior et al ? Of course you know we are more in difficult times, one you know that there are no jobs in terms of people who go to the university and study for years until they come out and those that have skills are being careful with their skills as a lot do not want to show people how they made it because the comedy industry is being crowded. So, a lot of people are being careful to show young people how they can make it. They can tell you the secret of success but the main secret itself they will never reveal it to you. Secondly some f the young ones even if reveal it to them they are not patience as a lot of young ones today will not know the patience you have gone through to get to this level as all they want is that they want to make it now. How many students would want to come here during their Industrial attachments as interns come here to learn without being paid? They don’t want to come why because they are looking for places where they will be paying them money and not where they will get the skills. As I trekked from eagle Island to NTA Port Harcourt most times without transportation to learn from Mr. Eric and Ejiro from their programmes. How I get there and come back nobody knows…it was a period of lesson as I learnt so much from them without even them knowing that I was learning from them. But today like I did mention the result is so massive. Young ones around they want play Nairabet , Coupon and they want to take Tramadol drugs overdose to get high… they think by getting high they will get money like that. So, what should the young ones know? Young ones should know that one the system of education where they build us with colonial mentality as Senator Ben Bruce always says this that era has gone as I read Petroleum Engineering imagine that I am looking for job in the oil companies till now. Just imagine what my life would have been. The Musician Falz the rap musician is a Lawyer, but law never provided one thing for his table. So that is the problem. I studied Physics but here I am today? That is you will be resolving Momentum Forces! ( Laughs) The government should tell the young ones sensitize them that you need skill inasmuch that you are going to get educated in a field even in the university there should be new courses as in ICT , Entrepreneurship these things should be studied right there at the campus and not …so many medical Doctors do not have jobs. So many Nurses do not even have jobs. And you are going to study Chemistry and come out from Chemistry and you want to Teach you still need Education experience and you have to go back to school maybe to College of Education to do an Educational Course and even when you come back at the end of the day they are paying you N25,000 or N20,000 per month. So, we must fall back to talent and grow that industry so that we can solve the problem of unemployment. How can we use Comedy to pass message to the youths about how best to stop curb drug abuse and human trafficking issues in the society? Like the Port Harcourt Comedy Club is a platform which we use to heal various sectors and cement relationships in our society in this our next edition we are inviting “MR PRESIDENT” –MC Tawgie a very look alike to President Muhammadu Buhari and if you go through our programme you will see that we are playing host to the Director General of NAPTIP Barrister Julie Donli Okah at Port Harcourt and it is a special edition to stop Human trafficking we do this every First Wednesday of the month and last month we played to Stop Port Harcourt SOOT campaign team as we gave them award for their steadfastness and their dedication and love for the environment. That is in recognition for world Environment Day. We are in a dying moment in my time when I was much younger the libraries were in functional times. The best you can get to is to get to the Library as you study and you make friends and you think about going to the university. And you think about making good grade. Then you have this vision that you want to be a plus to the society but now we do not have that moment anymore. We a youth that is divided within the illegal oil bunkering and we have those that are in the street in the name of street cultism. And you have those who are sunk into drugs and not only guys just now but girls , women as you might be surprised that teenager within your environment has some bit of Tramadol, Codeine in her bag as she goes to school and they are naturally high and they do not believe that anybody is older than them in the society ones they take that drug and the drugs make them feel that there is no pain , no suffering and that life is sweet. So, it is a problem but government should begin from now through the ministry of Health to raise a sensitization programme on Television, radio and newspapers every medium including social media to sensitize young people and see how they can go for campaigns within those corners like you go to town have the Abuja town, you have the Bundu waterfronts, and you have the Elechi Beach waterside. There should be campaign and you can use celebrities also to push this campaign we can do our bit through our performance making humour and out it on social media condemning the act. But the Government also have another act to play even the musicians will also help in their movies not to portray plenty of smoking, “highness using drugs” and all that. The music today has so much control on these young people. May you give us your family background? Angel D’ Laff is a global being as a young man I met life tough and from a polygamous home, rejected. But I had the determination inside of me as I saw my future ahead of my kinds back then and I decided to give it a force even when I was written off there were that zeal inside of me to survive so, I survived through and got to the university and studied Petroleum Engineering . I came out and got married to the most beautiful woman on earth and this marriage is blessed with two kids. And we are not just parents but we are parents to other people as we are father figures to so many people. We are a change to the society and we are people who believe that no-matter where you are coming from that you can make it. And no matter what you do there is a time when the master will visit you and when the master visits you those labours you have labored for years it will pay off. It might not be now but the master will come and when the master comes those pains be written off. I am from Nembe in Bayelsa State.